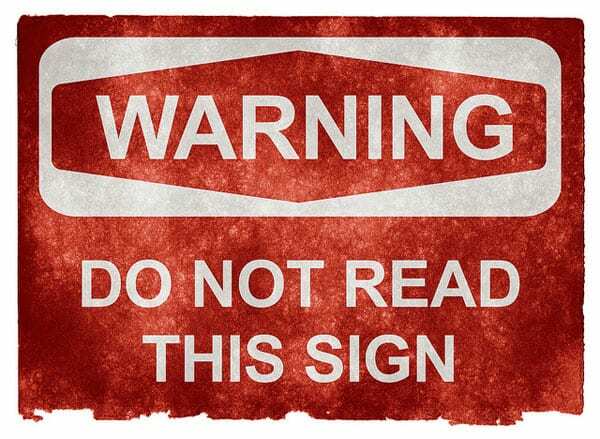 “Warning: Do Not Read This Sign.” Nicolas Raymond. With the release of the latest New York State Attorney General’s Pennies for Charity report and its accompanying database, alarming headlines and oversimplified warnings about fundraising expenses and overhead have arrived, just in time for the holiday giving season—and in a year where we have finally determined there’s been a real decline in the number of low-income households donating to charity. As it coincides with similar warnings in other states, the overall effect for someone who reads a number of publications is the impression that the public is being barraged with warnings about taking care in giving. And, in turn, that may result in less enthusiasm about making that gift. While the expertise of many professional fundraisers assists charities to fulfill their missions, some fundraisers engage in dubious behavior that has a negative effect on charitable giving. Some fundraisers charge exorbitant fees that significantly reduce the funds left for the charity. Others provide potential donors with misleading information about a charity to spur giving. The enthusiasm to stamp out malfeasance is delivered through the Charities Division and the assertively titled Operation Bottomfeeder, whose work has been discussed previously in NPQ with respect to defending legitimate charities against exploitation. Described in the report as “an ongoing initiative that targets sham charities operating in New York State to exploit popular causes like breast cancer prevention…to enrich professional fundraisers,” the mandate was expanded last year to also target businesses that enable charities to solicit from the public. This includes everything from professional fundraisers using misleading pitches to accountants who aid in obscuring data. Significant outcomes from 2018 operations included shutting down Menacola Marketing Inc., which paid financial penalties and agreed to dissolve in a settlement related to scam charities associated with veterans’ causes, where, among many disturbing issues, it was identified that less than two percent of funds ended up going to actual veterans. Of course, these types of sensational stories, representing a tiny fraction of the sector’s activities, are always more likely to capture the public’s interest than the daily good news of providing critical community services. But over time, with constant repetition, they erode public confidence in the sector. It’s a challenge for all nonprofits, including the more than 82,000 registered New York State charities, because it raises important questions about how the sector as a whole can manage the unusual scenario whereby transparency and oversight have increased, but donations from small and medium donors continue to decline. The Democrat & Chronicle coverage, headlined as “One-third of donated money stays with fundraisers: How to avoid being scammed,” is certainly not atypical of how the report will be interpreted, but it does contribute to ongoing narratives that a) many nonprofits cannot be trusted, and b) “overhead is bad.” It’s a public relations battle that charities have been losing for years, a problem attributed at least in part to the rise of charity evaluation services, even after they made efforts to walk back their claims about the usefulness of overhead ratios as a means of judging nonprofit effectiveness. This just isn’t so, as explained by Claire Knowlton in NPQ’s “Why Funding Overhead Is Not the Real Issue: The Case to Cover Full Costs,” where part of the discussion tackles the challenge of determining what actually constitutes “fundraising.” Even with professional guidance from government, lawyers, and accountants, many different interpretations of expenditures can be considered “reasonable” within federal and state guidelines and regulations. The reporting of functional expenses exacerbates the myth that, somehow, nonprofits should be able to operate programs without an administrative structure to manage, measure, and execute. It implies that, by some as-yet-unknown magic, nonprofits should be able to achieve their mission without dedicated and systematic fundraising efforts to pay for it….Certainly, not all spending in a nonprofit is efficient; but functional expenses tell us nothing about efficiency. To borrow from the example given in Knowlton’s article, if an art organization hosts a gala to showcase the work of its students, and the works of art are being sold with a portion of proceeds to the charity, are all the expenses of the event fundraising expenses? Or just the expenses that go to outside professionals? Or is it all a program expense? These quizzes have been offered up before, and we’re compelled to let you know that this one, too, is rhetorical in nature. Asking donors to do more work when making donation decisions does swim against the tide of the quick-fix digital age, but in the end, when charities are working within the law, ratios in a database should only help support purposeful questions. They can’t offer any meaningful insight into a charity’s expenses, or more importantly, what value to the community comes from their efforts. However true that is, though, any sector the public is consistently warned to be cautious about will eventually begin to feel the results of a general disaffection. This is bad news for nonprofits, which must depend upon public trust. As we see it, though, the fault does not lie solely with regulators. Perhaps it’s time for this sector to take a different approach: help support its own regulation, develop its own narrative, and sharpen its own set of lived values.